At Advanced Basement Systems we pride ourselves on providing our customers with the best products, practices, and results available anywhere in the industry. Over the years, our patented waterproofing products and exceptional service have earned us many customer testimonials and referrals throughout Ontario. Since 2003, Advanced Basement Systems has been dedicated to providing our customers with the best service from the first call onward. If you're not available during a weekday, many of our specialists are also available during evenings and weekends. We want to schedule our visit when it's convenient for you! As the options to waterproof your basement are presented, you'll be in full control of the process. The cost of waterproofing a basement or drying a crawl space depends on how you customize your solution -- no two jobs are ever the same! What you will not experience are high-pressure sales tactics or prices that suddenly drop ten to fifty percent. Our personable, professional representatives know that our products speak for themselves, and we work off of a published price list. These are our employees who work in basements every day, and they're the best at what they do. Flooding basements, leaking wall cracks, and mouldy crawl spaces are the kinds of challenges they specialize in! Our service to you does not end the day we complete the installation. At Advanced Basement Systems, we like to follow up a few days after the work is completed to make sure that everything was complete the way it was proposed. Additionally, our staff will make a note about your completed work, and when your annual service is due to be scheduled. If we don't hear from you around the date that service should occur, our staff will give you a call, reminding you to keep your system running at optimal performance. Get Started With A Free Waterproofing Quote! At Advanced Basement Systems, we'd like to help you transform your dark, damp, musty basement into the extra floor of usable, dependable space it's meant to be! Don't wait to reclaim your basement space! Call or e-mail us today for a free waterproofing quote! 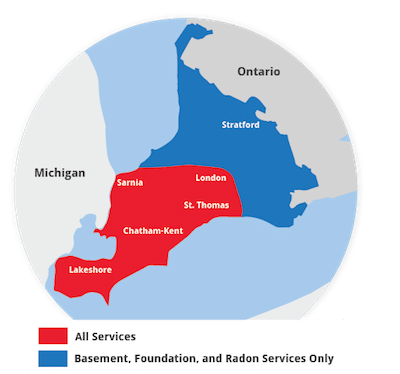 We service the Ontario area, including Chatham, Sarnia, Windsor, London, surrounding areas such as Stratford, Windsor , Leamington, St Thomas, Amherstburg, Strathroy, Essex, and nearby.